Breastfeeding rates in Wakefield District are low; fewer women start to breastfeed their baby than in many other areas, and fewer women are still breastfeeding by the time their baby is 6 weeks old. The way breastfeeding rates are measured has changed. 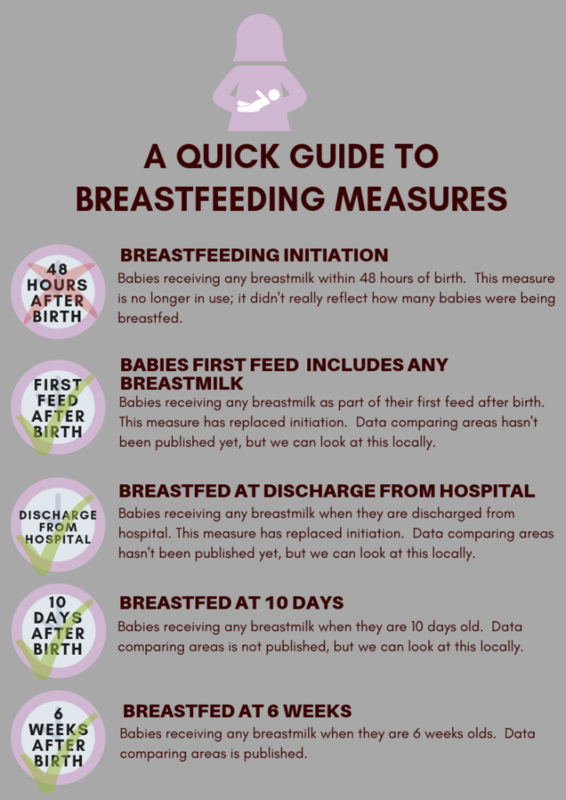 Historically breastfeeding initiation was used to look at how many women were starting to breastfeed, this has now been replaced with two additional measures; baby's first feed (any breastmilk) and baby breastfed at discharge from hospital. Information showing how Wakefield District compares to other areas has not been published yet. One to one home visits – FAB aim to contact every breastfeeding mother within 48 hours of discharge to offer breastfeeding support tailored to individual needs. Weekend Support – one to one breastfeeding support is available in the FAB base each Sunday 9.30-3.30. Please call 01977 801359 on a weekend. 24 hour helpline–FAB offer a 24 hour breastfeeding helpline for all mums in Wakefield, this is manned by trained staff and volunteers on a voluntary basis and the number is 01924 851901. Breastfeeding Support Groups – Breastfeeding groups are available across the district on a daily basis. Please see our website www.familiesandbabies.org.uk for up-to-date group venues and times. Breast Pump Loan Scheme – FAB facilitates Wakefield breast pump loan scheme. Pumps are available on short term loan to breastfeeding families who meet an agreed criteria and are referred by a health professional or FAB peer supporter following a breastfeeding assessment. Peer Supporter Training – FAB offer accredited training opportunities to women who have breastfed and would like to volunteer and support other mothers. FAB Centre - 31 All Saints Walk, Floor 1 Green Carpark, The Ridings, Wakefield, WF1 1US. Wakefield Breastfeeding Voices - a service user involvement group using the experience of mums in Wakefield to enhance the local service offer. Search for Wakefield Breastfeeding Voices on Facebook.